Monet’s property at Giverny is surrounded by high stone walls. This is nothing special in Normandy, as many estates and gardens are a so called ‘norman enclosure’, in French ‘Clos normand’. The walls are a good protection against rabbits and deers, and excellent for privacy. Here is a pic of Monet’s second studio seen from the main street of Giverny, rue Claude Monet. This building is not open to the public. 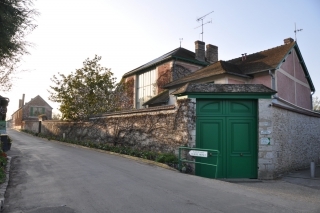 It houses offices and reception rooms for the administration of Fondation Claude Monet. At Monet’s time, it was used as a studio where Monet stored the paintings for sale, and completed them if necessary. Monet designed the studio to receive northern light. The big green gate was the gate to the garage sheltering his car, a Panhard Levassor that he bought in 1900. On the far left, Claude Monet’s main house appears in the distance.